WHEN I first clapped eyes on our long-term Vectra VXR estate I laughed out loud. I’m a bit of a show-off, you see. At the weekend I wear Hawaiian shirts. So when I saw the vivid blue VXR, with its huge alloy wheels and body kit, it was funny. It fits my persona exactly. If the Vectra was on my choice list, I would have one. Because as well as being a show-off, I’m also middle-aged (Crisis? What crisis?) and live with three women (a wife and two daughters) and the constant threat of dog ownership. Too much luggage and regular trips to the DIY store for bits of wood are the story of my life. 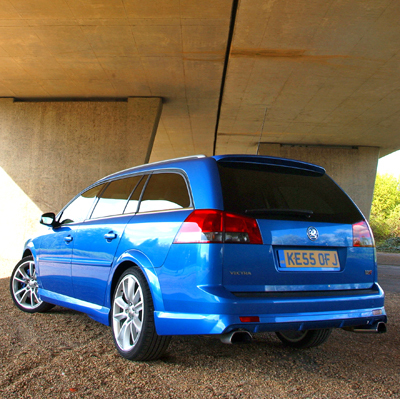 A good-looking, load-swallowing, road-burning estate car like this is made for blokes just like me. A colleague described the car as a ‘batchelor pad on wheels’ and certainly the stylish black cockpit with its leather-edged Recaro seats and flashes of red and chrome VXR-iness is very cool. It’s very comfortable, too. The turbocharged 2.8-litre V6 engine sounds fantastic. The note is high-pitched and the twin exhausts release a metallic rasp. 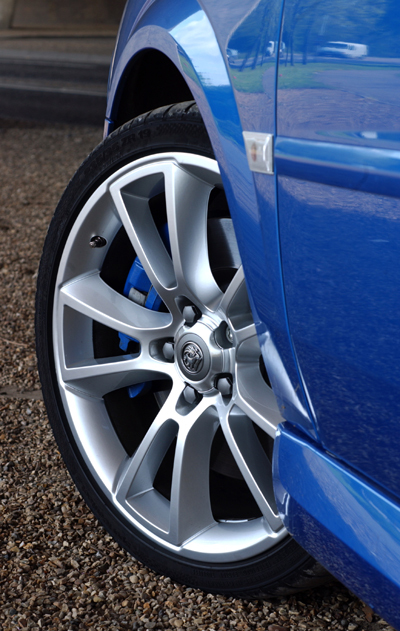 Vauxhall quotes 251bhp, enough to propel the Vectra to 60mph in 6.7 seconds and ultimately 158mph. So it’s quite a beast, and my fear was that with all that weight behind and those two front wheels scrabbling about up front, the Vectra might understeer like a Doberman on ice, but it doesn’t. It drives really well, with a good weight to the steering wheel and little evidence of body roll. Press the ‘Sport’ button on the centre console and the car feels even firmer, like it’s clenching its buttocks and bracing itself. Pressing this activates the highly complex IDS2 system, which links functions such as the anti-lock brakes and stability control systems to the electronic dampers which can adjust their action on the move to boost traction, braking stability and roadholding. The front disc brakes are huge – a good thing too on a car capable of almost 160mph. I can’t fault their power and progressive feel. The only niggles so far are with the CD changer and the wiper/indicator stalks. Six CDs are fed into a single slot on the dashboard. I worked it out once and made it swallow Steely Dan’s greatest hits, but I can’t make it spit them out again. I’m also struggling with the action of the indicator stalk. You nudge it gently for three clicks and harder to stay on all the time but it’s difficult to differentiate between the two actions. After nearly a month, I’m still having problems getting used to it. Also, each pull of the wiper stalk moves you up and down the wipe speeds and you have to rely on an audible ‘clunk’ to tell you when you’re back to ‘off’. I’m told this is an improvement over the original Vectra’s design, but the sound is hard to hear above the engine noise and the DAB digital stereo. Hopefully, familiarity with the car will iron out these issues by the time of my next report. And hopefully by then I won’t have had to go out and buy a dog guard either. WITH 251bhp under the bonnet, we’re not expecting much in the way of fuel economy. Vauxhall claims an average of 27.4mpg for the VXR, but the noise as the turbocharged 2.8-litre V6 engine nears the red line makes driving this car with restraint difficult. Other than that, we’re expecting the usual Vauxhall Vectra virtues – strong build quality, cavernous boot, reliability and a decent level of standard equipment.